Have you said or thought either or both of those things? If you have, you’re wrong. I’ll write a separate post on point No. 2 above. Let’s start with the flexible part. Those yogis’ bodies are made of the same stuff as yours and mine. Yoga isn’t for the flexible. It makes us flexible. I’m constantly inspired by "Yoga Journal" cover girls, but that’s a small percentage of the population. They’ve been practicing for years. They didn’t just wake up one day with bendable bods. Granted, some are naturally more flexible than others, usually in particular areas. But by saying those yogis are “more flexible than me,” we’re giving ourselves an excuse that’s not valid. When I first started practicing yoga, backbends were extremely challenging. I couldn’t get into a camel pose and wheel pose seemed like a joke. Now, these are two of my faves. Why should we care about flexibility? The less flexible we are, the more we need yoga. 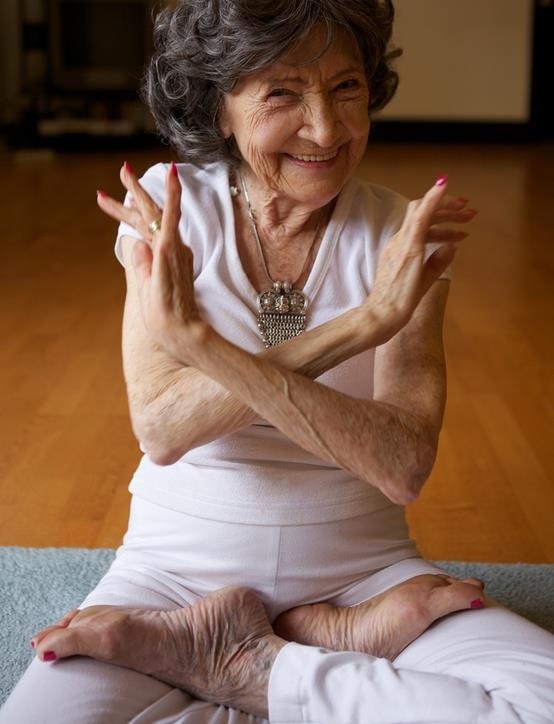 Flexibility is one of the first things to go as we age. Why should we care? Well, for one thing, we could be doing this in our 80s. Which is totally rad. But beyond that, being flexible helps us avoid injury and keeps our bodies functioning better. It allows us to travel and sit more comfortably since our body can move in various ways. I dunno about you, but I want to live a long life. And I don’t mean live to be an old age, I mean really LIVE fully without being restricted by my body. How do we begin if we’re really not flexible? So maybe at our first yoga class we aren’t “good” at it. We can’t even touch our toes and the human pretzel on the mat next to us makes us feel inadequate. Trust me, I get it. I can be my own worst enemy. Yoga isn’t about touching your toes, it’s about the journey on the way down. Silly, right? We must accept where we are, turn our awareness inward and trust the process. I remind my students that yoga is a personal practice. Every time we step on our mat our bodies and minds are different. And each time, it requires a different practice. It’s up to us to have that conversation with our bodies and honor its needs. As yoga teachers, we serve as the guides for your practice, but we cannot really teach you yoga. Not the real yoga. Only you are responsible for your attitude and willingness to listen to your body. I can’t listen to your body for you. Unless maybe you fart. But that’s gross and not the point. Here are some pointers for getting over your own self-criticism and mental blocks. At one time or another in my yoga journey, I’ve followed one of these tips, and they helped me learn to be present in my practice and accept where I am. Do I get frustrated with my practice? Yeah, sometimes. I’m human. Sometimes when I can’t nail a pose I get angry. Then I mentally run through some of these tips and snap out of it. Mirrors can help us check our form, which is helpful. But more important than seeing the alignment is feeling the alignment. And let’s be honest here. When we’re looking in the mirror, we’re looking at (and often times, judging) our bodies, not our form. Many studios don’t have mirrors for this very reason. If your studio does have mirrors, challenge yourself to ignore them. Trust me. This is quite possibly the best thing I’ve ever done for my practice. Let’s not be rude, of course. One of the wonderful things about yoga classes is the sense of community and positive energy. But once the class begins, it’s ME time. Let’s ignore what Sally McPretzel is doing. When we’re present in our practice, yoga is a great gift. Once we draw our awareness inward, it’s easier to honor our bodies. We are listening and observing our bodies — what feels good, what doesn’t feel good, what flat-out hurts. We can do less or more or change the practice to make it our own. It’s not about the full variation of the pose. It’s about YOUR variation of the pose IN THIS MOMENT. When I first started practicing yoga, I avoided props. I had the uninformed idea that props = weakness. That is far from the truth. Props help us and the “better” I’ve gotten at yoga, the MORE I’ve incorporated props. If the teacher suggests using a prop and it feels good to you — USE THE PROP. Like I said before, yoga isn’t about touching your toes. It’s about the journey on the way down. And some yogis will say that you shouldn’t celebrate your progress because that’s not the point. But I think we should celebrate ourselves sometimes. Did you lift up into your first crow? Smile! Celebrate! Every once in a while, when we’re feeling defeated by a pose, it can be helpful to reflect on how far we have come and celebrate that progress. Look, even @superhumanyogi didn't start out so super-humanish. Yoga can transform us in so many ways. Increased flexibility is one. A lack of flexibility isn’t a limitation in yoga. Your perception of your “bad” flexibility is the limitation.